Tim makes a great point. I have spilled a lot of digital ink discussing the problems with monetary policy in the past, and in particular, with the Fed’s rate hiking campaigns. The results have always been, without exception, either poor or disastrous. In the “rush to be bullish” this a point often missed. When markets are hitting “record levels” it is when investors get “the most bullish.” Conversely, they are the most “bearish” at the lows. Two charts show the ignorance in that statement. 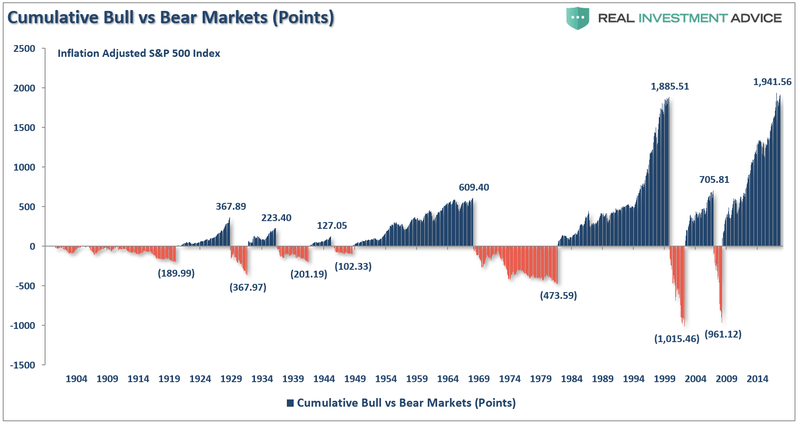 Bull markets, with regularity, are almost entirely wiped out by the subsequent bear market. Another comment showed equal ignorance of market dynamics. Yes, they do seesaw and, for the most part, are almost always equal in nature. (a 100% gain and 50% loss are the same thing) For every bull market, there will be a bear market. But, as shown above, it is clearly not the case that bull markets rise 10x higher than bear markets fall. Market participants never act rationally. Neither do consumers. This is the problem facing the Fed. Currently, there is a very high level of complacency with a strong belief in the motto “The Fed can do no wrong.” Or should I say, there seems to be a very large consensus the markets have entered into a “permanently high plateau,” or an era in which price corrections in asset prices have been effectively eliminated through monetary policy. Interestingly, it is that very belief on which the Fed is dependent. With the entirety of the financial ecosystem now more heavily levered than ever, due to the Fed’s profligate measures of suppressing interest rates and flooding the system with excessive levels of liquidity, the “instability of stability” is now the biggest risk. All of these surveys (both soft and hard data) are blended into one composite index which, when compared to U.S. economic activity, has provided a good indication of turning points in economic activity. Currently, the index has peaked from it’s second highest level on record. In every previous period where the index achieved current levels, it had been near the peak of that economic cycle. It is also worth noting the 6-month average of the Leading Economic Index (LEI) has recently turned down and this index reliably leads the EOCI by a couple of months. It is here we find the biggest potential risk for the Fed. The Fed operates on current economic data as it comes in. However, all economic data is revised in the future, and when those revisions become sharply negative, the results aren’t good. For example, in December of 2007, no one believed the U.S. economy was in a recession. However, after a near 50% plunge in asset prices and the worst economy since the “Great Depression,” the NBER officially stated in December of 2008 the recession had started a year earlier. Such was not an outlier event, but rather the norm for NBER recession dating. I would disagree with Tim on the last sentence. As shown below, when you overlay our EOCI index with the Fed funds rate, we see that every rate hiking campaign denoted the “beginning of the end” of every expansion period. Unfortunately, as Tim notes, by the time the data is revised, it will be well after the point at which the Federal Reserve should have stopped their rate hike campaign. Unsurprisingly, when the Fed eventually “breaks something,” the downturns in the EOCI index also coincide with a stock market contraction as well. Growing economic ambiguities in the U.S. and abroad: peak autos, peak housing, peak GDP. At the moment, there certainly seems to be no need to worry. Unfortunately, by the time the Fed realizes what they have done, it will be too late.